Alissa is one of those friends that wasn’t so sure about Vera when I first started carrying it, but just like most of my friends, she slowly but surely began to like it. I bought her a Yellow Bird Clip Zip ID case for Christmas two years ago. She likes black and I figured the print wasn’t too loud or old ladyish, not that Alissa would shy away from loud. On the same day that I gave her that, we went shopping in Roseville at the Signature Store. 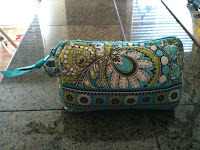 I forget what I was shopping for, but Alissa found a small cosmetic case in Peacock and bought it to throw in her purse or diaper bag. 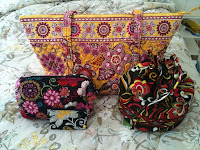 That was enough Vera to last her a while, but slowly but surely she started collecting more pieces. Last Christmas she got a Bali Gold (aka, Pink Lemonade if you are Alissa) Miller. Alissa has a cousin named Christy who also loves Vera, so that didn’t help. 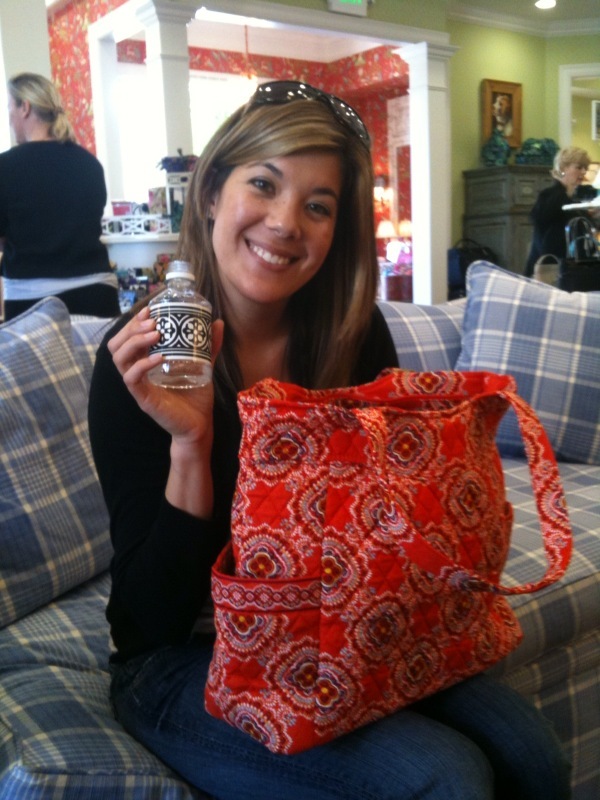 She met up with her cousin for lunch one day while Vera was having a sale and decided to go check it out. Alissa ended up with a Large Cosmetic, Ditty and another Miller. The Miller ended up getting returned, but she kept the rest. Most recently she bought a Pleated Tote in Paprika to take with her to our sorority convention in Orlando at the end of the month. 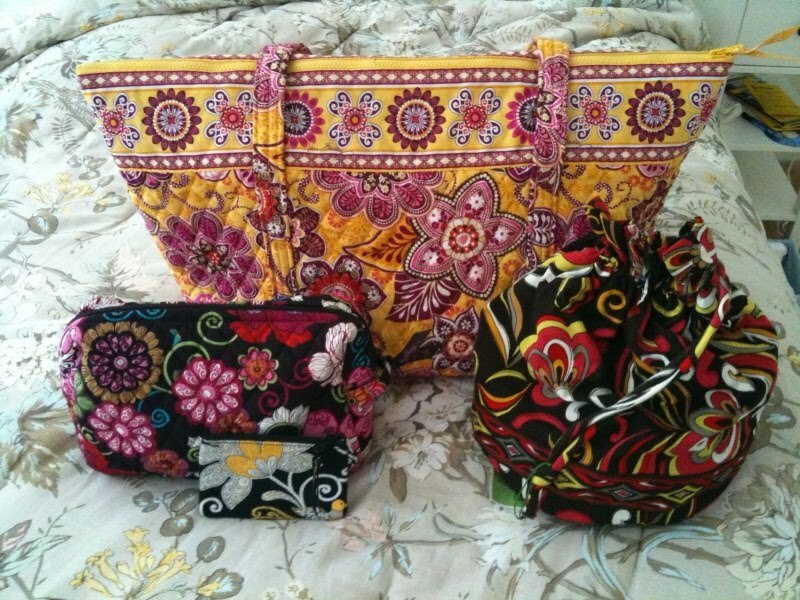 I think that she is going to be shocked to see how many people at convention are carrying Vera! It is fun to be able to go Vera shopping with Amber and Alissa when I am in Sacramento, so I am glad that they are both fans now! Alissa even has recruited new fans! She dragged her coworker Tiffany with her to a Signature Store and last I heard, Tiffany has more Vera stuff than Alissa! It just takes one and then you are hooked! You are correct, it just takes one. I just ordered a Hipster for $29 (today only) a Large backpack and wallet and pen for my 16 yr old for the new school year. Oh course I had to get something for myself! I got the Night and Day beach towel. I love your blog - I found you from Vera on Facebook. 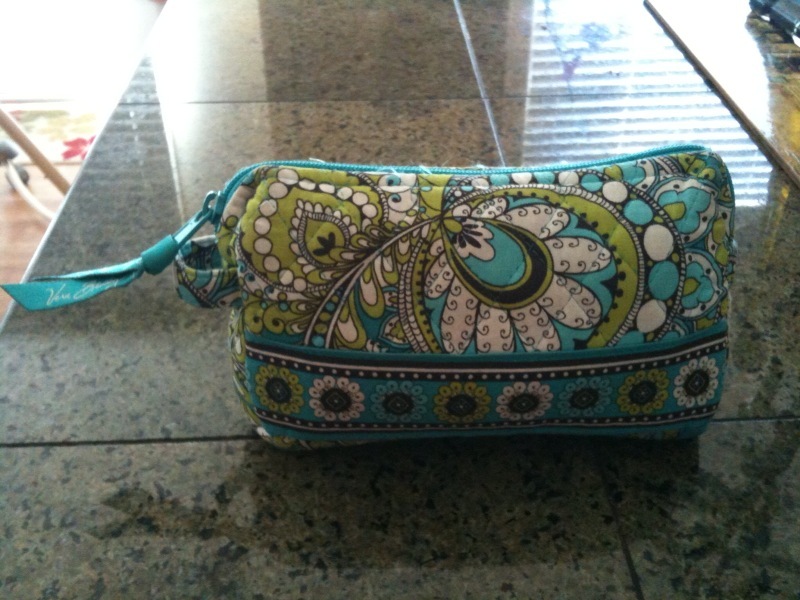 It makes me smile that you've got your college friends liking Vera Bradley. Hi Tracey! Welcome to the blog :) Sounds like you found some great deals! I just got the hipster I ordered and I can't believe I waited this long to get one.